This elegant needlepoint throw pillow would make an excellent addition to your home or a great gift for any dog lover! 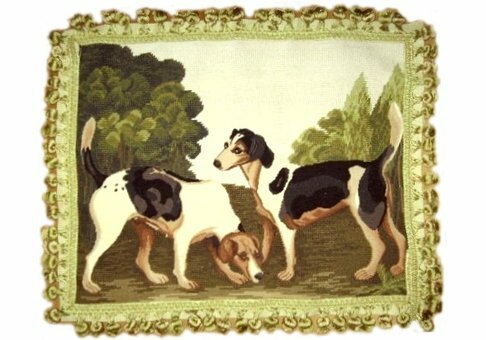 It features two beautiful English hounds bordered with a lovely green tasseled trim. This dog pillow is made with 100% wool thread and filled with 100% goose down. The back of the pillow is a solid coordinating color made with 100% velvet. Additional Information: 18" x 22"